The new partnership is aimed at increasing public exposure to digitized illustrated books and artists’ portfolios in the LBI’s collections that may not be available anywhere else. Struck, Hermann. Land Israel: 25 Original Radierungen. Frankfurt am Main: J. Kauffmann, 1921. LBI Library call No. r (f) NE 654 S8 L3. 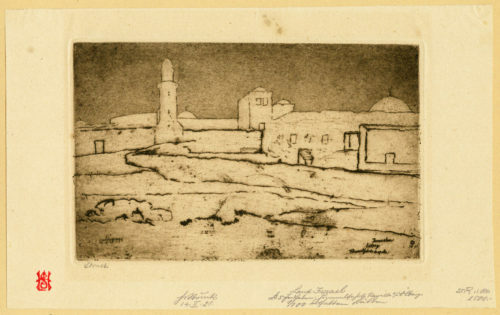 This portfolio of etchings portraying the geography and architecture of Mandate Palestine by the Illustrator Hermann Struck (1876–1944) is one of about 100 titles now available through the Getty Research Portal. The LBI has joined other world-renowned institutions that have contributed digitized books to the Portal, including the Metropolitan Museum of Art, the Institut National d’Histoire de l’Art, and the Heidelberg University Library. The LBI had already digitized a collection of illustrated books and artists’ portfolios, with support from the Metropolitan New York Library Council in 2008. The digitized works included books and portfolios by prominent German-speaking Jewish artists such as Ephraim Moses Lillien, Emil Orlik, Hermann Struck, and Max Liebermann. While these books were already available through the LBI’s digital collections portal, art historians and art students using the Getty Research Portal will now be directed to resources at the LBI they may not have been aware of. 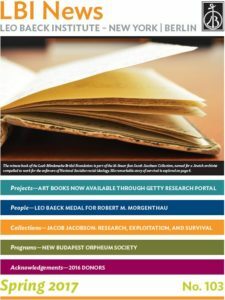 Staff from the LBI worked with the Getty Research Institute to identify the books’ catalog records and then to upload them into the Getty Research Portal. In total, seventyseven books from the Leo Baeck Institute’s library are now part of the Portal, with plans to upload more digitized art-related books in the future.